Carb-Free Cauliflower Crusted Pizza Recipe! You are here: Home / Recipes / Dinner / Cauliflower Pizza Crust Recipe! Low Carb! 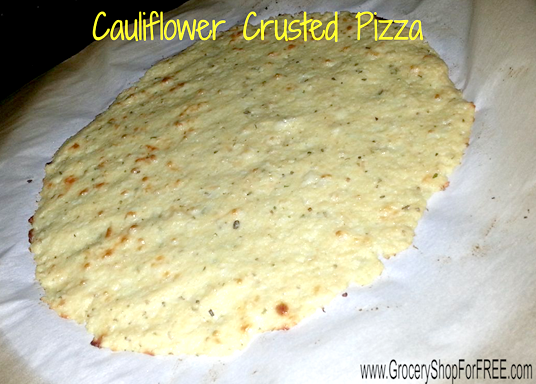 Cauliflower Pizza Crust Recipe! Low Carb! Cauliflower Pizza Crust Recipe! Low Carb! Since we are basically on a Ketogenic diet or “Keto” diet we no longer eat sugar and carbs. That means giving up bread and chips and pasta and pizza, right? Well, maybe not! For pasta we use zucchini, for mashed potatoes we use cauliflower which is super good with butter, sour cream, and cheese! Potatoes were the thing that made me fat in the first place and the reason I had to lose over 100lbs! I would eat them baked, mashed, french fried, or run over with a car – it didn’t matter – I had some form of potatoes at every meal – hashbrowns, chips, fries – you name it! SO, that was what I thought I would miss the most – but the cauliflower substitute is really good! Then there was pizza… I mean come on in this day and age pizza is a mainstay in our diets! Enter cauliflower again! It’s so versatile! This Cauliflower Pizza Crust is crunchy and holds up to the toppings well! For a while I have wanted to try some carb-free recipes and Cauliflower Pizza Crust has been on the list! Well, I finally did it and I made a video, too! Pulse the Cauliflower in a food processor until it looks like snow. Place Cauliflower in a microwave safe bowl and cover it with a dish towel or loose lid. Cook on High for 4 minutes. Place the cooked Cauliflower in a dish towel and remove the liquid from the cauliflower by“wringing” it out to get as much liquid out as possible, try to dry it out like flour. Use gloves or wait for it to cool – it will be VERY HOT, right out of the microwave. I was able to squeeze out 1/2 cup, but it still could have used a little more liquid removed. Once liquid is removed mix the cauliflower and the rest of the ingredients in a bowl. Oil a piece of Parchment Paper like you would oil a pan when baking. Place your dough on the Parchment Paper and begin to make your crust, not too thick, and not too thin. Slide the Parchment Paper with the crust on it onto your pizza stone/pan in the oven. Bake at 450 degrees for 9-12 minutes. Remove from oven and “dress” your pizza. 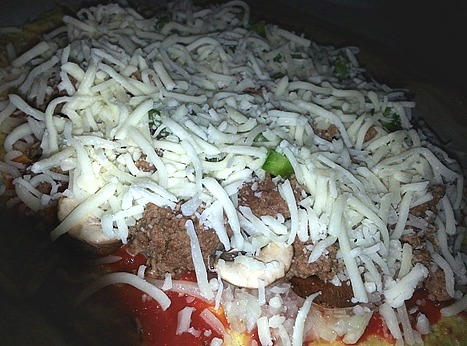 Spread tomato or pizza sauce on your crust, add desired amounts of cheeses, meats, and veggies, top with cheese. Place “dressed” pizza back in the oven at 450 degrees for 5-7 minutes – enjoy!